LIC Login for LIC India New User Registration, LIC Policy Status Check online and online payment of LIC Policy Premium using Debit, Credit Card and SMS based helpline service from LIC Customer portal through LIC Login…. LIC are abbreviations of Life Insurance Corporation which is an insurance company that offers different insurance services which include; Term Insurance, ULIP, whole life, annuity pensions, money back plans and endowment plans. The Indian based company ensures that all its clients get their support in case a peril strike. Currently, several people are signing up for insurance covers to mostly cater for their medical bills and education. This is because there have been several events of Indian citizens being held in hospitals after completion of treatment since they are unable to cater for the medical bills. Moreover, parents can start savings plans for the children’s education as early as they are eight years. For policyholders, one is required to make small monthly payments to the insurance company and therefore this plan does not discriminate against anyone regardless of their social class. Years ago, any interested person had to visit the offices of LIC so as to register and undergo several steps before being issued with the policy. However, currently one just requires a smartphone or a computer that is connected to the internet to acquire the services provided by Life Insurance Corporation. This process takes less than thirty minutes and saves clients time and money that would have been wasted visiting the firm’s offices. When you want to register as a new client of LIC, there are few steps which you ought to follow which include. Always start by navigating the official website of LIC India which is www.licindia.in After Login. Once you have navigated the LIC India website you will be automatically be redirected to the homepage. 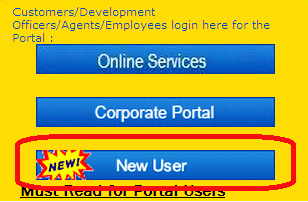 On the home page there are several tabs with different options, always ensure to click on the tab labeled “customer portal”. Once you click the LIC customer portal the page browser will land you on another homepage with different options. Here, you have to first to select the new user option since you don’t have an account. The “new user” option always navigates open up a new page where you are required to fill in your personal details and any information on the policy you wish to purchase. You address and contact information is also mandatory here. However, other clients cannot access any information that you add on this page. Moreover for you to complete your registration, you will be required to make payments online by sending money from your account to the specified account number in your portal. After you agree to the terms and policies of LIC, your new account will be automatically generated. At this stage, you are allowed to access an account and required to add a username and a password which should at all times remain a secret to yourself. Sharing your password with other people may lead to distortion of your insurance policy. 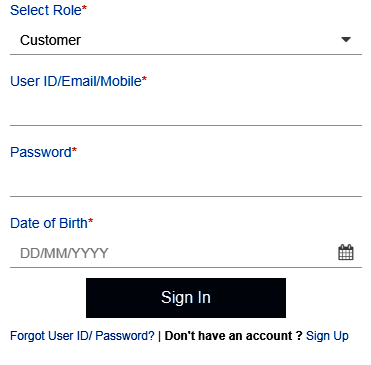 After you have added a username, password and date of birth the LIC login option automatically pops up at the bottom of your screen. Once you are logged on, you are at the liberty of checking out for available policies by clicking on the “enrolled policies” option. Using your smart phone or computer which is connected to the internet, browse the official website of LIC. On complete navigation, the website always opens up the homepage of LIC which always has several options. Be sure to click on the “premium pay “choice which is always the third option on the list. On clicking on the premium payment option, you will be automatically be redirected to another page which has a table with two items which are; pay direct( payment without logging in) and pay through the LIC customer portal. Select the pay direct option, this on browsing will be redirected to a page which has different premium payment methods. In this page, you are required to submit details that are pertinent to the policy like; LIC policy number, your name, age, details of other dependents that will be covered in the policy, your telephone contacts and homes physical address. Moreover, it is on this page where you are required to select your premium payment plan before verifying the captcha to prove you are human. On submission, you may decide to create your own account if you wish. However, if you are not ready to create an account terminate the connection soon after submission of these details. It is wise to regularly check the progress of your policy and this can be done easily on your phone within few minutes by following the following steps. Navigate the official website of LIC and select the customer portal url at https://www.licindia.in/Home-(1)/LICOnlineServicePortal. If you don’t have an account, follow all the required procedures and create your online portal page, and once your account is ready you can start the policy tracking process, for clients with existing accounts, you will be automatically be redirected to the login page. Once you have been logged on successfully, you can now choose the policy option from which you will choose the status option. In the status option, your payments and the progress of your policy information is readily available. Currently, most people own smartphones and computers and this means that they get to check the progress of their success online. However, the LIC Company has not left out people who do not own these smart gadgets. You can also check the status of your policy by making a call to the insurance company or by sending a text message by following the following steps. Start by typing ASKLIC( space)( insert the number of your policy)( space)( type premium which is the type of your policy and then sends to 1241. ASKLIC (space) (policy number for example 45678876) (space)(bonus) this is a procedure for checking LIC bonus. This text message can be sent from anywhere in India and it is free of charge. If you wish to confirm the status of your policy through a phone call, just dial the helpline number which is always 1241. This call is available in both English and Hindi so as to cater for the illiterate clients of LIC. Forgetting is part of the many weaknesses that human beings have. Forgetting your password and username for your online LIC portal could be breath-taking, however, LIC got you sorted and thus you don’t have to worry and stress yourself over it. Below are some of the few steps which you could follow to recover your lost password or username. Quickly write an email to LIC informing them that you are unable to recall your password and username through the following email address bo_eps1@licindia.com . In your email, “new query” should be the subject. The company is committed to client service and therefore you are guaranteed of a feedback within a period of thirty minutes. In the reply, the company always ensure to send you the username and the password for your account. With this password, you are now able to log into your account and make any changes in the password as you wish. You can also retrieve lost logging in details by sending a text message or calling the insurance company. The company has strict rules for punishing anyone who tries hack into the account of others by asking for recovery and therefore this should not be tried by anyone else apart from the policy holder. Before the online portal was established, the clients used to pay for their policies by visiting the company’s offices and agents. 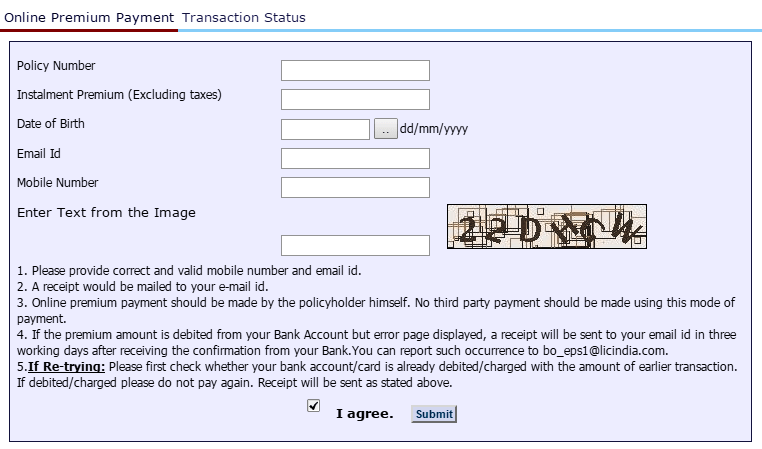 However, currently, if you wish to make payments for the policy, you just have to log into your account in the portal. Once you are logged on, choose the premium payment option which is included in the list of other services offered online. On browsing this page, you will be redirected to another page that contains two slots options which are; direct payment and customer portal. Click on the customer portal so as to make payment for your policy from your online portal. By clicking the login, you will be able to access the enrol policy option. In this option, you will be able to make online payments with your credit or debit card. It is advisable to keep checking out for updates and reports so as to download a copy of your payment receipt. Visit the LIC website (http://www.licindia.in/) and select the online services option. A page pops up having the registered user option and the new user option, select the registered user option. You will be required to fill in your password and username an enrol policy icon will appear on the left side menu. 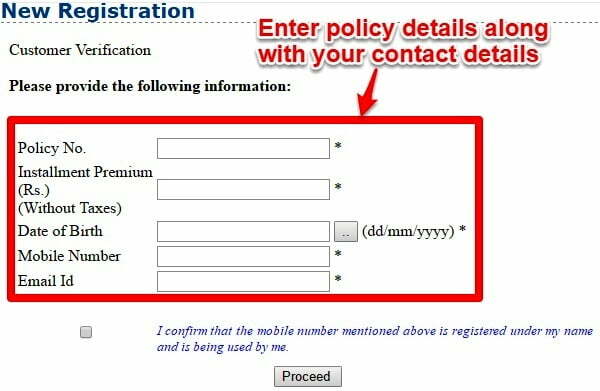 After which you will be required to fill in your policy number and the amount of premium that you are to pay. Click on the second option of viewing the enrolled policies a page with a code will appear, fill in the code as it appears and click on the submit icon after which you will be able to view the enrolled policies and for more details click on policy number snap on the pay premium online option. Click on the online services two options will appear; registered user and pay direct, snap on the pay direct option. A page will appear requiring you to fill in; policy no, premium, DOB, Email address, mobile number and a code that will be displayed on the page. After clicking on the submit button, there will be a choice to pay for the debit/credit card. Snap-on whichever the card you want to pay the premium. Select the type of card which will determine the list of banks will appear to choose the bank and snap on submit fill in the bank details and snap on the make payment icon. You will receive your receipt and duplicates will be sent to your email. At this level you are at a liberty of downloading and printing your receipt for future references. The company has gone ahead to come up with a mobile app which contains all issues pertinent to the LIC. The LIC mobile app is available for both android and windows phones. This mobile app is accompanied by several services which include. My transactions: in this section, a client is able to view all the payments he or she has been making since the policy began. And, any other future payments which he or she is expected to make. The registered portal option enables clients to access all the services which are available on the official website of the LIC. Plan group; this forum gives clients all the choices of the available plans provided by Life Insurance Corporation for example; pension, endowment, annuity and money back plans among others. Pay premium; it is an option in this app which enables you to make payments for your policy using your mobile phone by linking it to your bank account. With these services you have no reason not to have an insurance covered. Taking an Insurance cover has become an easy activity as you only require your mobile phone or computer and a stable internet connection.